Being home to one of the largest aquariums in the Southwest, Moody Gardens has so much more than amazing aquatic life to showcase to its guests. Located in the Aquarium Pyramid’s South Pacific and Caribbean exhibits are large habitats with beautifully colored artificial corals. Who knew it was even possible to create something nature made by hand you ask? We decided to ask one of our experts about this marine marvel. “Larger coral habitats can be created using tinted concrete that’s hand carved or textured using latex pads to create the surface look of a coral reef,” says Greg Whittaker, Animal Husbandry Manager; who explains the coral process in greater depth. “Smaller, individual corals are made using fiberglass or epoxy resins that are tinted and surface painted. These individual corals can then be attached to a reef structure with spaces in between textured and painted to look like encrusting algae, sponge or encrusting corals to create a dynamic, realistic habitat.” Oh but not to worry, these chemicals are 100% fish friendly! 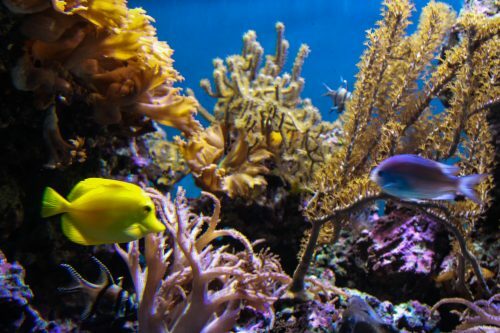 Most aquariums have opted to the creation of their own tropical reefs as maintenance for live coral is challenging. Live corals are typically slow growing and require very specific water quality and high intensity UV active lighting. The logistics of maintaining water quality and providing enough lighting to grow coral can be tedious and costly. The lighting needed to grow corals consumes a lot of electricity and produces a lot of heat as the sun is being replicated in most facilities. Although it is possible to extract live coral, it’s not often encouraged as it is vital to the ocean’s ecosystem. Since 2005 the Moody Gardens staff has participated in workshops with Project SECORE in an effort to assist in coral conservation. The project focuses on sexual coral reproduction by collecting and growing embryos in aquariums all over the world. The staff has increased their annual monetary contributions since 2012 and just recently became a facility partner. Be sure to join us this holiday season as the Aquarium Pyramid will reopen on November 12 – January 8th. Currently the aquarium is undergoing a $39 million dollar renovation. There will be a few more waves of the renovation as it will be open for Spring Break with more work to follow. The work in the Aquarium Pyramid will be completed in time for the Grand Reopening in May 2017. Displaying the various oceanic regions of the world, guests will plunge to the depths below to view penguins, seals, sharks and so much more, including a new, expanded exhibit of vibrant live corals! Previous Previous post: What You “Otter Know” About our Otters! Next Next post: Calling All Islanders!